Experience The Benefits Of Floating At Home. Since then, we've sold Zen Float Tents all around the world and gotten hundreds of people floating at home. 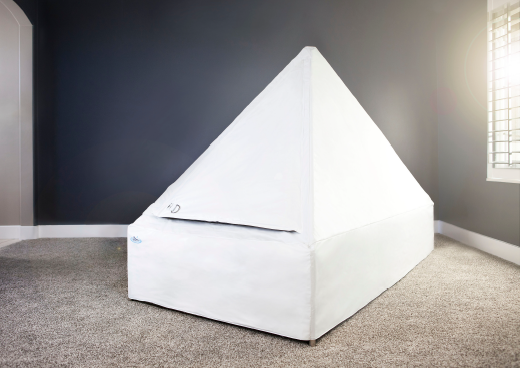 The Float Tent maintains all the elements of a traditional sensory deprivation tank in a revolutionary design that is intended for affordable home-use. This is where the signature Zen pyramid design originated. The shape allows condensation from the warm-water to run down the sides and back into the tub, preventing water from dripping off the ceiling and interrupting your float. 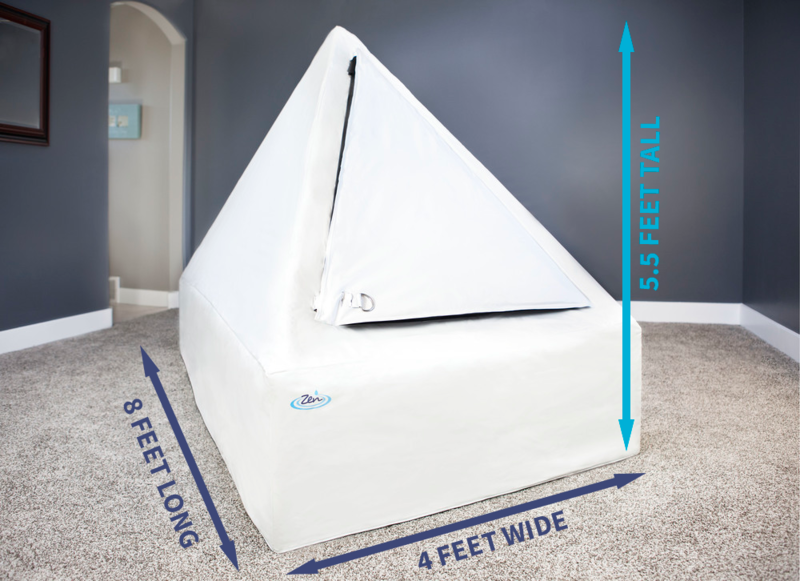 Easily fit the Zen Float Tent into any room of your house with it's convenient 4 ft. by 8 ft. footprint. Big enough for a comfortable float but still small enough to fit in any home. 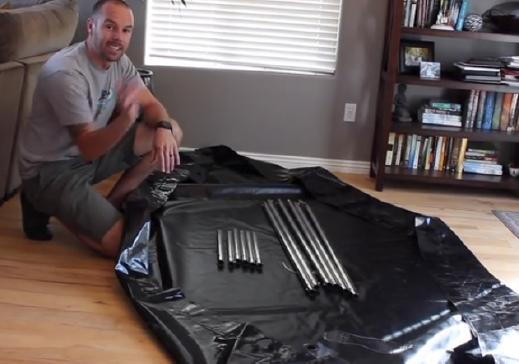 We selected the best materials for the Float Tent we could find. That means lab testing to ensure all the vinyls used are BPA free and pass a rigorous 7 Phthalates (7P) testing*. All parts come with a warranty so you are protected. We knew that these were going to be used in people's homes which is why we chose a thick, double layer vinyl that is welded not seamed, to ensure no leaks or tears. The frame is made of a high-quality stainless steel so it will never rust. The outside of the Tent features a white finish vinyl that looks great in any home, while the inside is made up of a black finish vinyl to effectively block out any external light. Total darkness, water temperature control and an amazing filtration system all wrapped in a pyramid design to ensure great airflow, no annoying dripping and a full blown sensory deprivation experience. The Zen Float Tent comes with 2 radiant heating pads, a digital temperature controller, and a high-powered UV filtration system to keep your water heated and cleaned and all times. Easy to ship, easy to move. The Zen Float Tent can be shipped anywhere around the world in two small boxes. If you ever have to move or relocate, it's easy to drain the water, disassemble, and move with you. Knowing that these were going to be used in people's homes, we searched for a material that was light enough to ship but still extremely durable. Setup takes around an hour and maintenance takes less than an hour a week. We know how important it is to float without any added anxiety or concern for your own safety and that's why we designed the Zen Float Tent from the ground up selecting the best materials we could find to ensure no leaks or tears. To keep monthly operating costs low we chose the most energy efficient parts and components to keep your bills reduced. We have a 10 year warranty on all manufacturer defects. If we make a mistake in manufacturing, we'll replace it every time. Mechanical parts are a little different, as there is a natural wear and tear like any machine and we can't say it will last forever. We can say, however, that we will replace any mechanical part that is faulty for one full year. Is the Zen Float Tent Right for You? You might have questions, and we might already have the answers. - You’re looking for the lowest priced, best value & most affordable home float solution on the market. - You’re ready to make an investment in your health & well being. - You're looking for relief from stress, anxiety, depression, pain or injury. - You really want a float tank of your own. - You float regularly or want to start floating more regularly. - You want to save money over going to a center & paying membership fees. - You don't mind doing a small amount of weekly/monthly maintenance. - You’re ready to Find Your Zen. - You plan to buy it for commercial use. - You don't plan to float at least once a month. - You want to avoid doing any tank maintenance. - You don't mind paying float center membership fees. How much Epsom Salt is needed for initial setup? 800 lbs. (363kg). We also recommend buying an additional 50-100lbs (20-45kg) to replenish the Tent for around a year. How often does the salt need to be changed? If maintained properly, the water and salt solution should last you at least for 18 months, in some cases up to 2 years. How do you drain the Zen Float Tent? We recommend buying a sump pump that can connect to a hose, to pump the majority of the solution out. A small amount of remaining solution will need to be manually removed with a small bucket or cup. Is the Zen Float Tent sound proof? No. While designing the Zen Float Tent we really focused on a light-weight, thin walled design so it would be affordable, shippable, and easy to move. 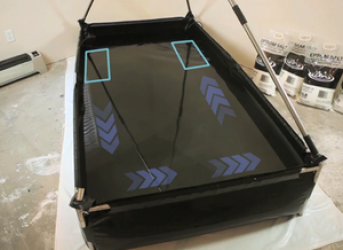 Even the most expensive float tanks don’t eliminate sound, they only reduce it. You’ve got to have a quiet setting if you want to float at home. How do you know when you have enough salt in the water? The best way is to use a Hydrometer which is included with the purchase of your Zen Float Tent. Salt is added until specific gravity is between 1.23 and 1.3. Is there a warranty on the Zen Float Tent? We want you to trust that anything you buy from us, we will stand behind. That is why we have a lifetime warranty on all manufacturer defects. If we make a mistake in manufacturing, we'll replace it every time. Mechanical parts are a little different, as there is a natural wear and tear like any machine and we can't say it will last forever. We can say, however, that we will replace any mechanical part that is faulty for one full year. It's our promise to our customers that anything they buy from us is made to last. Ready to Experience the Most Affordable Way to Float at Home? It'd be rude of us not to ask. Let us know if you have any questions the Buying Guide doesn’t cover. Pls provide your Country Code (use 1 for the US) area code and 7-digit phone number. In case we can't reach you by phone. Let us know your questions, comments or concerns so we can be prepared to cover them. If you're outside of the United States, pls provide your country code. By checking "Yes, please call me" below, you agree that Zen Float Company may call and message you with offers and other info, including possibly using automated technology, at the number you entered above. Consent is not a condition of purchase. We’ve recorded your request for a call from one of our Float Tent Specialists - You can expect to hear back from someone within 24 to 48 hours.